The January WER report highlights the EPC contract just placed for an oil production floater, the first EPC contract for a major FPU since the contracting hiatus began in mid-2015. Also in the report are details for an FSRU ordered for use in India and a small FSRU ordered for Indonesia. We provide an update of the status of a pending FLNG award and review the future status of Petrobras’ serial FPSO hull program. 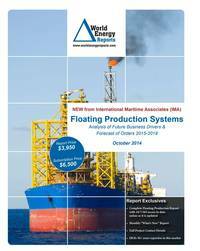 In the data section of the report are details for 201 floater projects in the planning stage, 51 production or storage floaters now on order, 288 floating production units currently in service and 28 production floaters available for redeployment contracts. Charts in the report update the location where floating production and storage systems are being planned, operating, being built and to be installed. Accompanying excel spreadsheets provide the report data in sortable format. Information is current as of 17 January.